Drug intoxication deaths have risen dramatically over the past several decades. From 1999 to 2016, the number of deaths due to drug intoxication more than tripled. Over the same period, the number of hearts recovered for heart transplantation has dramatically increased, with the proportion of hearts from drug-intoxication-related donors now making up 17.6 percent of available organs. 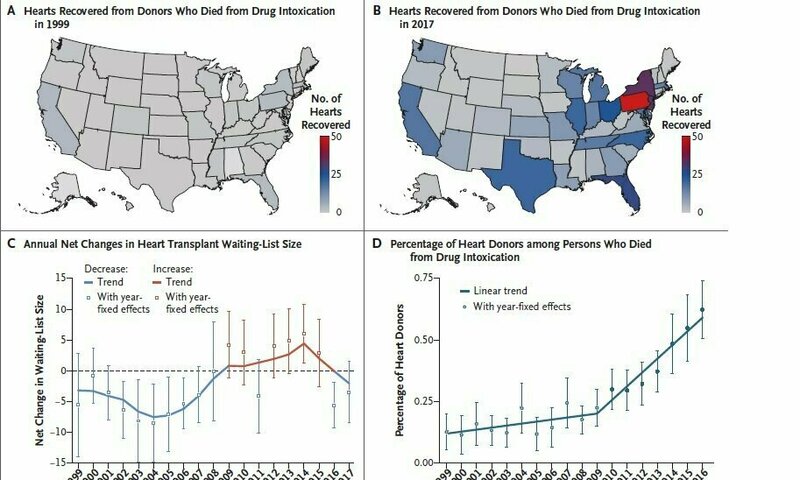 Transplantation and cardiology experts at Brigham and Women's Hospital, in collaboration with colleagues at the London School of Economics, analyzed these patterns as well as state-wide variations in the number of donor organs recovered from drug-intoxication-related deaths. They found substantial variability from state to state and region to region. Their findings are detailed in The New England Journal of Medicine. "In the U.S., the drug crisis is clearly not uniform, and neither is the rate of recovered hearts from drug-intoxication-related deaths," said corresponding author Mandeep Mehra, MD, the medical director of the Brigham's Heart and Vascular Center. "The fact that there's heterogeneity between regions means there's ample opportunity to learn from each other." The team analyzed data from the Organ Procurement and Transplantation Network to determine changes in the size of the transplant waitlist and data on drug-intoxication deaths from the Centers for Disease Control and Prevention WONDER online database. Bringing these datasets together allowed the team to calculate the proportion of recovered donor hearts from drug-intoxication-related deaths. The team reported major increases in drug-intoxication-related deaths and organ recovery in the Northeast, Midwest and Southwest. Overall, the team estimated that 6.24 hearts are recovered from every 1,000 lives lost due to drug intoxication. "Since one donor may provide a variety of organs to multiple recipients, the total number of people on waitlists who can receive a life prolonging transplant may be substantially higher," said Mehra. While the number of people added to the waitlist for heart transplants increased each year, the number of available organs has also substantially increased. The waitlist size began to shrink in 2016 and 2017. "This is a very important outcome indicating that people are now adopting organs from drug-intoxication-related deaths as a viable source for lifesaving donor organs," said Mehra. "Although we support organ donation recovery from this source, those of us in the transplant community also strongly support effective efforts to combat the drug overdose crisis. We must pursue ways to target the crisis while simultaneously looking for new ways to increase the availability of viable donor organs." Medical Xpress is a web-based medical and health news service that is part of the renowned Science X network. Based on the years of experience as a Phys.org medical research channel, started in April 2011, Medical Xpress became a separate website. Medical Xpress is a part of Science X network. With global reach of over 5 million monthly readers and featuring dedicated websites for hard sciences, technology, smedical research and health news, the Science X network is one of the largest online communities for science-minded people.